We absolutely love a creative brief, and when Netflix come knocking for a Stranger Things Halloween special you know it’ll be good. In the past we’ve already done some deliciously gory stuff for e.g. Netflix’ Santa Clarita Diet show, starring Drew Barrymore as a fully-fledged zombie-mum (brain burgers and “finger” hot dogs, anyone?). This time we were hugely honoured to be asked for the launch of the massively anticipated second season of Stranger Things. The favourite meal of the show’s central character are the not-so culinary frozen “Eggo” waffles - which she happily pops in the toaster to munch on whenever she is not busy slaying monsters from a parallel universe. 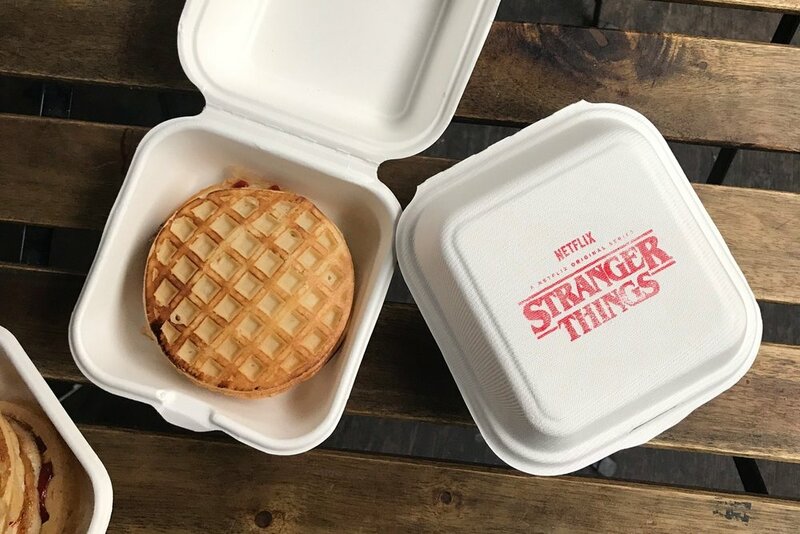 Our mission was to elevate the generally pretty mediocre concept of a frozen waffle to our signature level of super-deliciousness, while not losing the Eggo’s connection to the show’s story line and bearing in mind that – other than delicious and quick to serve – the product also had to be supremely Instagrammable and tell a story through cool packaging and branding. No problem! Our award-winning gourmet aged beef burger in an Eggo waffle bun (rather than the usual brioche) for the likes of Ed Sheeran, Nicole Sherzinger, Joan Collins, Claudia Schiffer, Alan Carr, John Bishop and Michael McIntyre, which we served at Jonathan Ross’ infamous annual Halloween bash. We absolutely loved collaborating closely with everyone - from the wonderful team at Netflix and their creative agency, to waffle wholesalers & the Council. “It was a real pleasure working with Mark and Lily on the Stranger Things 2 launch. The food initiative is a great example of passion, creativity and quality coming together. Mark provided some incredible food recommendations inspired by Stranger Things and he worked tirelessly to execute them to the highest possible standard - the food looked great, tasted amazing and it was all made from top quality - locally sourced - ingredients. Lily handled the logistics side of things and ensured everything was delivered seamlessly.